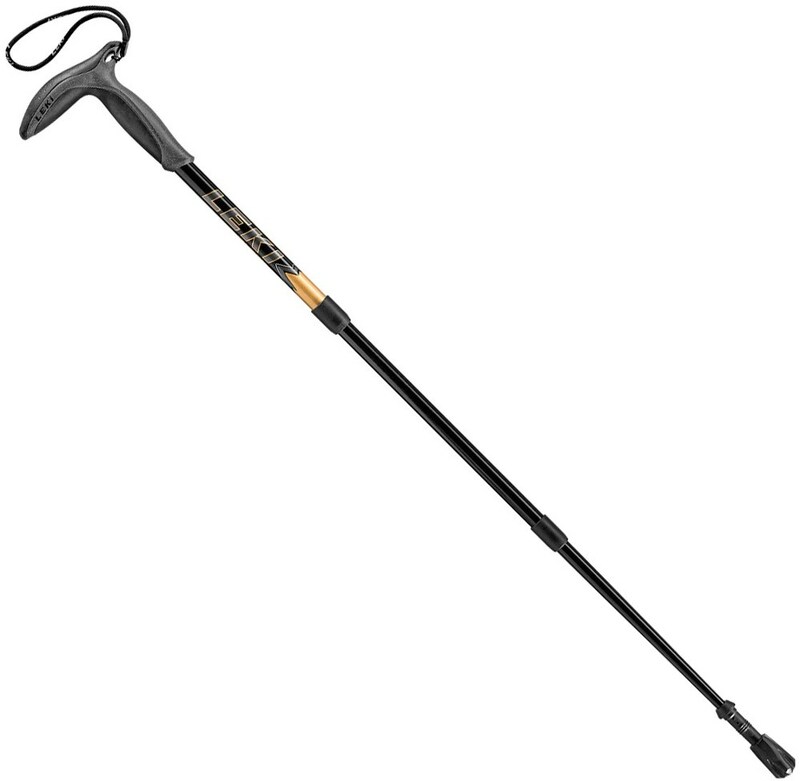 Great trekking pole for the money! Never bought a trekking pole before. Always found a stick on the trail. Finally bought Swiss hiking poles at W-Mart. Price was low and do they work great! Welcome to Trailspace, Douglas. I started out using this pole. It did not stand the test of time. After 100-miles or so the internal plastic cracked, and I could no longer lock it to any height. For the price, it's a good place to start. Thanks for posting. They are sturdy and dependable for the price. Work in woods, rock, and some inclines. The baskets kept coming off, so just kept them off. The grips are great but the straps are uncomfortable. Welcome to Trailspace, Sandra! How long have you had your hiking poles? I bought a Swiss Army hiking pole at a Target store about 10 years ago. I have used it on a lot of hikes, when wading rivers fishing, and as a cane when I had some health problems. It has never let me down. It is so light and comfortable especially with the shock absorbing tip, and the price is great too. Charles, welcome to Trailspace! Thanks for the review. I started out with a Swiss pole 7 years ago. When it gave out, I switched to another set. I was happy with the Swiss UNTIL I tried a superior brand. Still, for the price, it's a good deal. They work well for their intended purpose! On a hiking trip to Switzerland, we were unable to bring our trekking poles because they wouldn't fit in our checked luggage. Once in the village we were staying in (Murren...GO, if you never have! ), there was a shop selling many different souvenirs and some useful sporting goods items such as trekking poles. One of these was $20 so I bought it but then wondered how I'd get it back to the states. The shopkeeper cut off a length of cardboard tubing and gave it to me. When it was time to leave, we taped both ends shut securely, wrote my name and address on the outside and checked it at the airport. It didn't arrive at the same time our luggage did, but it did come to our home address by FedEx three weeks later. Anyway, I was very happy I had bought it as one of our hikes was all downhill and very steep in rainy weather making all the rocks and roots extremely slippery. My one pole saved me from a fall many times. The poles we already own are Black Diamonds and they are nicer and easier to adjust, but this pole does the job just fine. It's my one useful souvenir of a wonderful trip! Welcome to Trailspace, Colleen! I bet your Switzerland trip was fantastic. I've stayed in Grindelwald, which was quite nice. Oh yes, same neighborhood! It's all wonderful...I wish I could go at least once a year, but alas! Durability-to-price ratio is excellent. Comfortable grips with a nice overall feel. I picked up a pair of these @ Dicks about 6 years ago because at the price of $25 I felt they were at least worth a try. I've used them ever since and couldn't be happier. The locks continue to hold fine and the shock absorption qualities remain as good as when I purchased them. They have been used on extremely rocky terrain in the Adirondacks of NY, Vermont's Long Trail, NH'S White Mountains, and the Bigelow Range of Maine. Of course they have also been used on easier terrain as well in places such as the AT in NJ and were fine as would be expected. The hand grips were a nice fit out of the box and overall I am very pleased with this purchase. I have to agree with the other comments. The poles are great, especially for the price. I walk several times a day as part of my physical therapy. I have muscular dystrophy so am a bit unstable. The poles are exactly what I need to insure balance. The only complaint I have is that I can't find replacement rubber tips. I use the poles as much indoors as outdoors and could really use tip replacements. If anyone knows how to get replacement rubber tips please post and let me know. Thanks. I received a set of Swiss Gear hiking poles as an award at my company. On the outside, they look nice (cork handles, nice anodized finish, etc). The mechanical workings are another story. I noticed something was loose inside both poles. They were the nuts used to tighten the pole segments to prevent them from slipping. This made the poles totally useless. My company gave me another new set and these poles have the same problem. I do not know how quality control missed this on both sets. I have tried to use pieces from both sets to just get one set but have been unsuccessful due to the breakage of the cheap camlocks used inside the poles. Incredible!!! 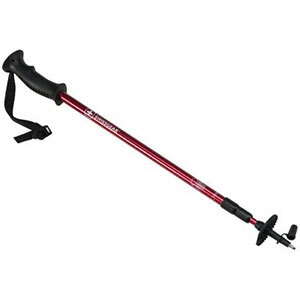 As an avid hiker with knee problems I always use hiking poles. Saw mounds of people on the AT with these and decided to buy them as an extra pair of poles. These are my fourth pair of poles, and they are incredible. My first 3 pair of poles were other brands ranging in price from $70 to $150/pair. The other poles would come loose when hikng, one pair I left on a trailhead in Vermont ($150), another pair damaged on rough trail in Maine. Decided to buy these due to the low cost but didn't expect much. Wow, was I wrong, they are great, they don't come loose at the joints, very strong and stable, comfortable handle angle, lightweight and you can't beat the price. For the one pair I left at the trailhead in Vermont I could have bought 6 pair of these. Get them, you won't be disappointed. For some reason, I bought a pair at Walmart, figuring I am going to lose them, so may as well not invest in them. These poles are actually very good. I can't complain about them, and the price is unbelievable. These are great if you'd rather spend more money on other gear and don't mind having colorful poles! My wife and I are in our late 60s and hike daily. My wife and I are in our late 60s and hike daily. We live in Hickory, North Carolina, as full time RV'ers and have daily access to an excellent hiking environment. We find the Swiss Gear Hiking sticks excellent. We have been saved from many falls that would have occurred without the Hiking Sticks. We find hiking provides excellent exercise, along with the beauty of the mountains and streams. With the aid of the sticks we are able to exercise the upper and lower part of the body. Walking sticks are best used on uphill ascent by equalizing the work between the legs and shoulders and downhill decent by braking our fall as we go down the hill. On level ground they help mainly with balance, preventing falls, when walking in ruts, gullies, etc. Swiss Gear sticks have all the features of the more expensive sticks, with an affordable cost. Make sure to use the wrist bands as they provide an integral part of the benefit of the sticks. It's hard to explain, but you'll notice once you use them for a while. The wrist straps on the Swiss Gear sticks are designed to go on a certain way, for ease of use. Experiment and you will see what I mean. This information is not published in any of their sales literature. The Swiss Gear sticks also have an excellent shock absorption which you'll appreciate after use. Hope you enjoy the sticks, keep up the exercise. What can I say, for the money how can you go wrong. What can I say, for the money how can you go wrong. These things can be very expensive. This particular pair, that's right two of them, I only paid $15 Walmart. So why would you pay $50 to a $100 for them? The only thing I don't like about them is the compass in the handle, it's not accurate and it's to small to view it at a glance, but other than that they're pretty rock solid. I recommend this product and it is an excellent choice if you are on a budget. Never used any other poles, but was well impressed with these. My wife and I decided after a recent backpacking trip to the Ozarks that poles would be a good idea. We live in flatter country (some hills, no mountains) and had yet to buy any. Last week we went to the Smokies and stopped at a Wal-Mart and bought 2 sets. We were day hiking with day packs of about 10-12lbs, making ascents of 2000ft in 2.6 miles, then another 1300ft in 5.5 miles. The last leg of the hike that I really saw how well these worked was a 5.3 mile descent of 3300ft. The first .7 miles of that was over very loose stones. I found that the poles helped me maintain balance, increase speed, and aid in descents. For the price, I am not sure anything can beat them. The locks on the adjustments did not fail at all, and I was putting all 145lbs on them in many parts of the descent. Well made, great performers. I love my Swiss Gear poles. I bought them at Walmart a few months ago, and I'm very surprised at how great they have held up. They have many miles on them now as I'm training up on local trails for a full out AT Thru hike. I've been putting weight on them, all out terrain changes from grass to rocks and whatever else can be thrown at them and so far they have been awesome! I went gear hunting the other day and pulled another brand off the shelf just to see how they were...well, they basically came apart when extended, and they were 3 times more expensive than my Swiss Gear poles. I'll stick with Swiss Gear. I'm even going to buy another set for my mom so we can walk together. Mine even have that little compass on the top which from testing it out, is spot on! Even after taking some abuse, it's accurate. I originally got them as a temporary thing to train with until I could get a more well known brand...Not even going to consider it now. I'm sticking with these. These poles are definitely recommended by me!! I bought a pair of Swiss Gear poles from our local Walmart. Great for hiking if you have bad knees like me. I bought a 2nd pair for my wife, you cannot beat the price and performance. My only disappointment is that I lost both my pole baskets on my 2nd trip out in the woods and cannot find replacements. If anyone has any information on getting replacements it would be appreciated. I did write to the company without reply. I've been using mine for a couple of years. For the price you simply cannot beat the performance. The construction is lighter than other brands my friends paid three or four times as much for, but that hasn't been a problem. I put a lot of weight on the poles while descending and they've held up fine. The ho-hum compass on the handle is actually quite handy for maintaining a rough heading. My only complaint is the baskets break, and get lost (common to all poles) and I don't know where to get replacements - yet. This is a follow up from my previous review. Replacement parts are available directly from Wenger. Baskets are $1 apiece and rubber tips about the same (I didn't ask the price, just ordered the part). 4 baskets, 4 tips + shipping for $15.34. The phone is 888-797-2769. Website is http://www.wengerna.com/index.html. Customer service wait time was about 15 minutes, but they were friendly and helpful. Part number for poles is SG66201. Two of these were purchased at Walmart recently. I love them so far. For the price they're a terrific bargain. I use them primarily for walking on concrete for exercise and because I need the stability and balance that two poles give. Does anyone know where to get new rubber tips for these poles or does everyone just toss them out and get new poles when the tips wear out? Also are you supposed to take the rubber tip off the steel point and replace it with the larger tip or just jam the larger one over the smaller one? No directions came with the poles so unsure how to work the tips. Thanks to anyone with information out there. Trekking poles are going to take some abuse; that goes without saying. For that reason, I was hesitant to spend $75 or more on a pair. I've never been a pole user, but I've been meaning to try them out because of the benefits they provide on scree, stream-crossings, steep terrain, etc. Not to mention their use as tarp poles. In the past, I just couldn't get myself to buy those SwissGear poles because of the silly compass in the grip. I wanted a tool, not a toy. On a recent trip to Wally World I noticed that they ditched the compass and now have cork grips. I bought two and have only taken them on a day hike so far, but I made a point to abuse them a little and they didn't die. The grips are actually quite comfortable, and the twist-locks held. I'm not crazy about the shock-absorbing feature, maybe because I'm so used to the firm plant of a ski pole, but that's a personal preference thing and not a ding on the poles. I'm curious to see how they hold up in the long term. So far, these things actually do the job, and at less than $10 each that's not bad. For the money you can't go wrong. Used them in very muddy terrain and on very rocky trails, put a lot of weight on them and have not failed me yet. Like I said, for the price you can't go wrong. You can't beat these poles for the price. They perform as well as any other brands that are 5 times the price. The tips grip rock and ice without slipping and have a decent amount of shock absorption. The compasses on the handle tops are cheap and not very accurate, but that's not why you buy the poles in the first place. Test the locks on the poles at the store, as sometimes customers can over-tighten them and ruin the mechanism. At this price, you don't have to cringe when you bend your pole. Great warranty as well. I just used two of these poles for backpacking in West Virginia and they worked quite well in both ascent and descent in uneven and steep terrain. For the price, they are a great buy. 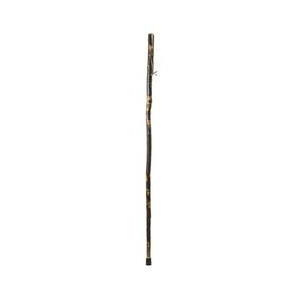 Well made, this telescoping hiking staff does well in its intended role. I would imagine that the weak points are at the joints when the pole is fully extended, but I have not experienced any problems myself. Also the compass in the top of the handle is unecessarily cheap and easily broken. At this price get two poles!! 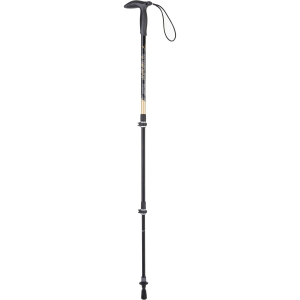 The Swiss Gear Hiking Pole is not available from the stores we monitor.